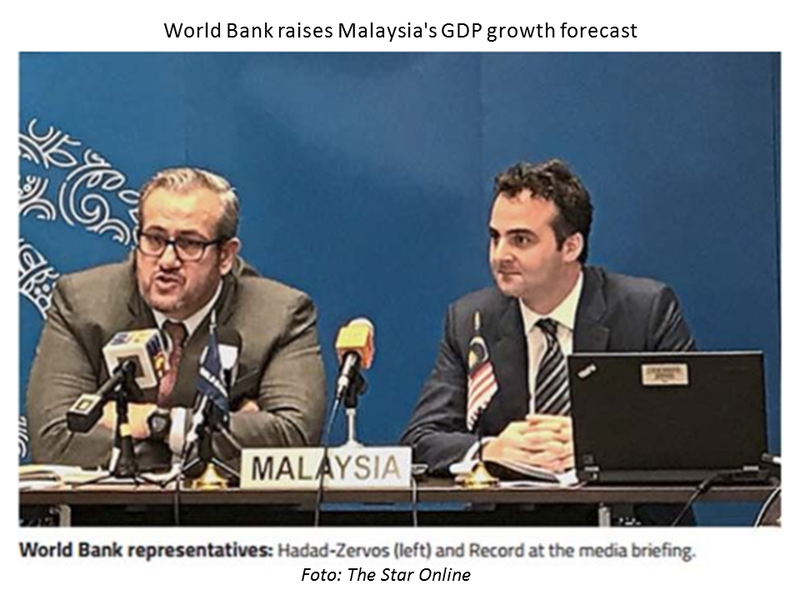 The World Bank recently reported that Malaysia recorded 5.8% economic growth in 2017, a high growth recorded close to 6.0% overall growth in 2014. 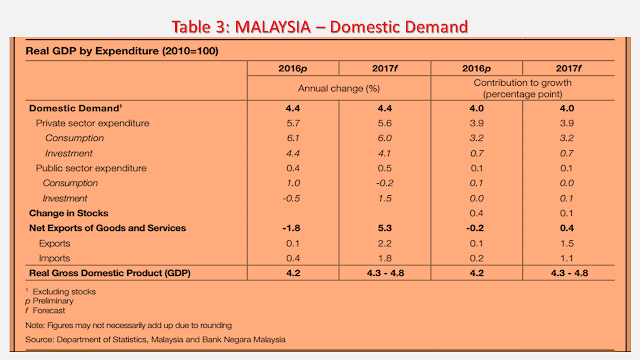 This high growth was significant after Malaysia experienced sluggish economic growth since nearly 10 years ago due to the economic slowdown in 2008. Is the 5.8% growth justifiable? 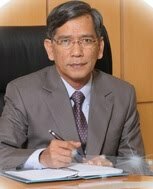 The following discussion examines the facts and evidence to prove whether the claim of Malaysia's economic growth rates for the year 2017 is valid? Malaysia is part of East Asia and the Pacific countries. Table 1 shows economic growth of the countries in the region. 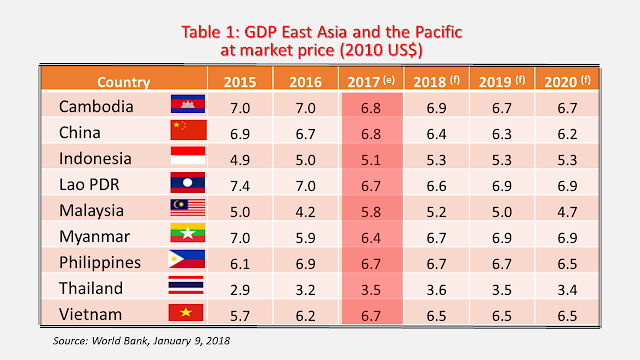 From the above Table, you may conclude that in 2017, Malaysia's economic growth (5.8%) is lower than that of other countries, such as China (6.8%), Philippines (6.7%), and Vietnam (6.7%). How do we compare the Malaysia's economic growth performance with other countries? The most commonly used method of comparing the performance of economic growth among countries is to refer to GDP in the year under review (2017) as compared to GDP in the previous year (2016). 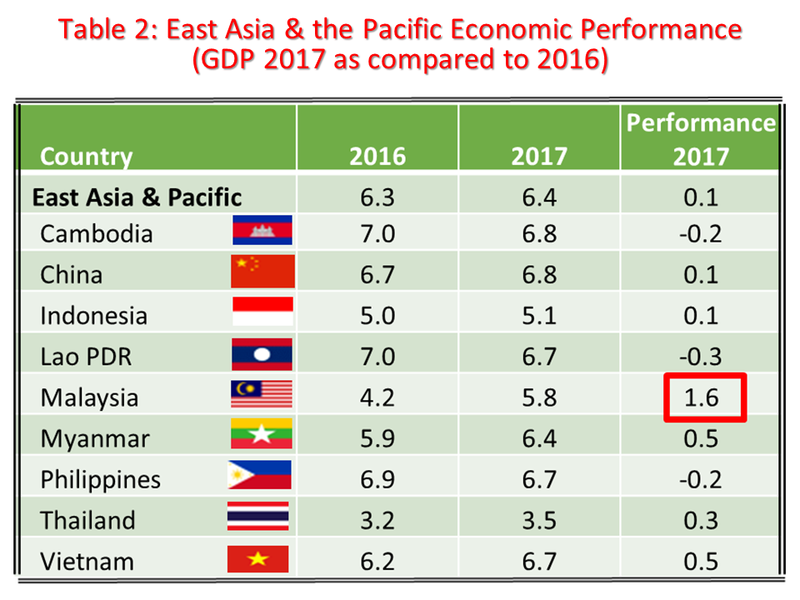 Table 2 shows the growth performance for countries in East Asia and the Pacific in 2017. 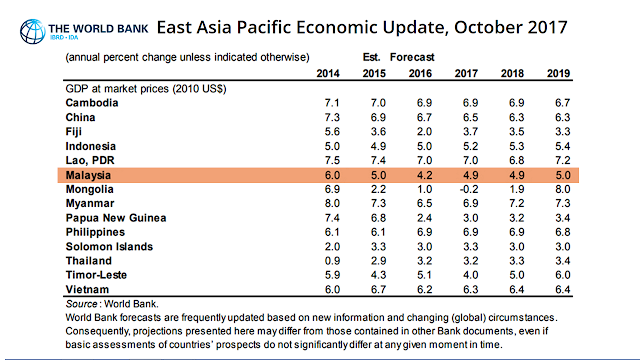 Overall, East Asia and the Pacific countries recorded a 0.1% growth performance. All countries recorded similar performance trends, ranging from 0 - 0.5%, except Malaysia. Malaysia recorded a very high growth performance (1.6%) in 2017 and the record was outside the general trend performance (outlier) among other countries in East Asia and the Pacific. We may not have noticed that Malaysia's achievement (1.6%) is too high, simply because we may see such figure as small. 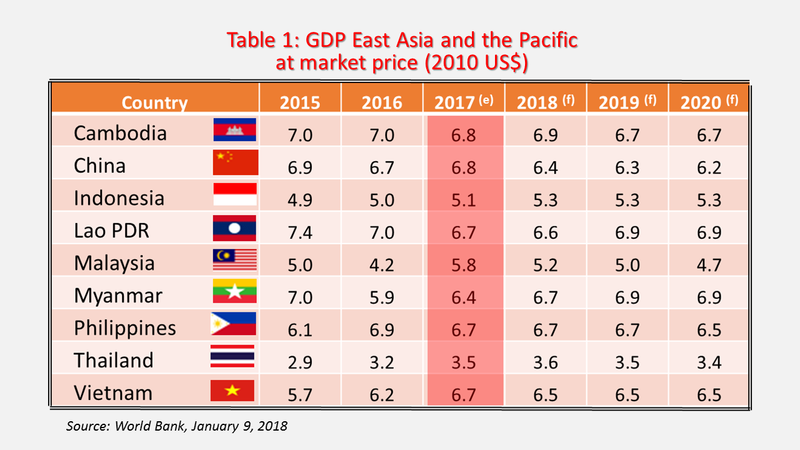 But if you calculate Malaysia's percentage of performance against the average performance of East Asia and the Pacific (1.6 / 0.1 * 100), the figure you will get is unreasonably high. Could it be that Malaysia has achieved such a high performance, which is very different from the performance achieved by neighboring countries in Asia and the Pacific? What are the contributing factors to Malaysia's extremely high growth performance in 2017? Does the domestic demand data support World Bank statements? The official statistics of the Department of Statistics (DOSM) and Bank Negara Malaysia (BNM) do not support the World Bank justification. 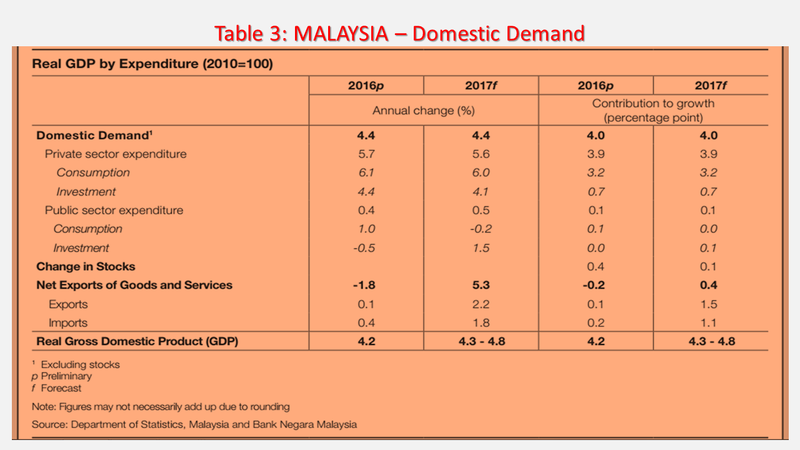 As shown in Table 3 below, domestic demand for 2016 and 2017 is the same (4.4%). Private consumption decreased from 6.1% (2016) to 6.0% (2017). Public consumption decreased from 1.0% (2016) to -0.2% (2017). Exports increased to 2.2% but imports also increased to 1.8% in 2017. In addition, current economic issues and public complaints reported in the media, such as low consumer purchasing power, closure of several hypermarkets, such as Giant, Aeon Big, Kedai 1 Malaysia, closing down of companies that caused retrenchment and unemployment, the cuts in operating expenditure for ministries and government agencies that could have a negative impact on economic growth, are among the issues that dye the Malaysian economy in 2017. The occurrence of these issues do not support the claimed high growth performance in 2017. Why World Bank revised Malaysia's GDP forecast upward for 2017? 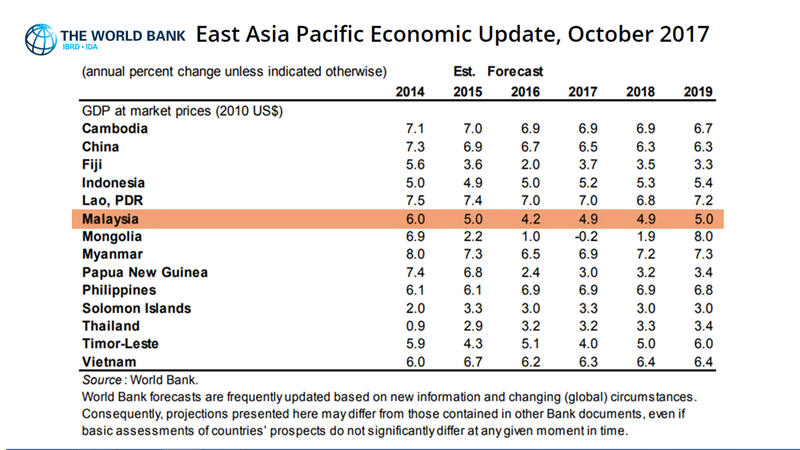 We are also unclear why the World Bank on 5 October 2017 suddenly changed the forecast of Malaysia's economic growth from 4.9% (see Table above) to 5.8%? (see Table 1), a projection change which is too high ..! While the changes of the growth forecast of other countries within East Asia and the Pacific are negligible, even though those countries are also experiencing the same global economic environment...! As rakyat Malaysia we will be very happy that our country achieves high economic growth. But domestic facts and figures do not support the justification of statements issued by the World Bank. As Malaysians, we feel disappointed as the claimed high growth performance of 5.8% of the Malaysian economy highlighted for 2017 is highly questionable.